Catastrophic Acts brings together major elements from LigoranoReese’s series of works entitled Melted Away which they began in 2006 – time-lapse videos that record the disappearance of large, performative sculptures and digital prints focusing on them as they erode and vanish. The title Dawn of the Anthropocene comes from Nobel prize scientist Paul Crutzen’s term for the increasing power of humanity on the Earth’s systems. In his and other scientists’ view, the world has entered an age where the impact of humans is as great, if not greater, than nature’s. Nora Ligorano and Marshall Reese have collaborated together as LigoranoReese for over two decades. LigoranoReese’s body of work is multidisciplinary and includes software art, physical computing, limited edition multiples, videos, sculptures and installations using a range of materials, traditional and digital processes. Since 2006 they’ve been installing “temporary monuments” during historic events. 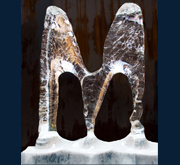 Sculpted entirely from ice, the sculptures disappear and vanish over a period of 16-26 hours. They melted down the word “Democracy” at the Democratic and Republican Conventions and the “Economy” in front of the New York Supreme Court Building at Foley Square in 2008; the “Middle Class” at the conventions in 2012; “The Future” during the People’s Climate March in 2014 and “The American Dream” in Cleveland and Philadelphia in 2016. Their artworks have been widely reported in the New York Times, New York Daily News, The New Yorker FoxNews, ABCNews, The Wall Street Journal, and The Economist among others and been the subject of ban attempts by the Republican National Committee. LigoranoReese’s work can be found in the permanent collections of numerous institutions, including the SFMOMA, The New York Public Library, the Whitney Museum of American Art, 21C and The Getty Institute. LigoranoReese live and work in Brooklyn, New York and have been affiliated with Catharine Clark Gallery in San Francisco since 2010. “On July 19th, a four-thousand-pound ice sculpture spelling out the words “The American Dream” was unveiled at Cleveland’s Transformer Station, blocks away from the site of the Republican National Convention. The sculpture, which was thirty feet wide and five feet tall, melted away throughout the day. Asked what the American dream meant to them, passersby often spoke of equal opportunity and financial security. “Maybe it’s time to have the American dream disappear, because maybe it’s not serving anybody,” Marshall Reese, who created the sculpture with Nora Ligorano, said. Ligorano and Reese did similar sculptures in 2008 and 2012, spelling out “Democracy” and “Middle Class,” respectively. A new “American Dream” installation will be on display in Philadelphia, at the Democratic National Convention, on July 25th. “Another piece bound for the conventions will also use words not quite taken at face value: giant ice sculptures spelling the phrase “The American Dream.” The work of the artists Nora Ligorano and Marshall Reese, the sculptures will be left outside to melt, and the dissolution will be live-streamed (starting in Cleveland on Tuesday) while poets and writers compose short pieces near the sculptures. Artists making smart work about politics understand this — it’s why Ligorano/Reese’s massive melting ice sculpture of the words “middle class” is improbably effective, at least when recorded and paired with a rousing speech by Bernie Sanders: because the artists turn the showmanship of politics into critique. WEBSITE AND SOCIAL MEDIA LINKS: website, Facebook, Twitter.